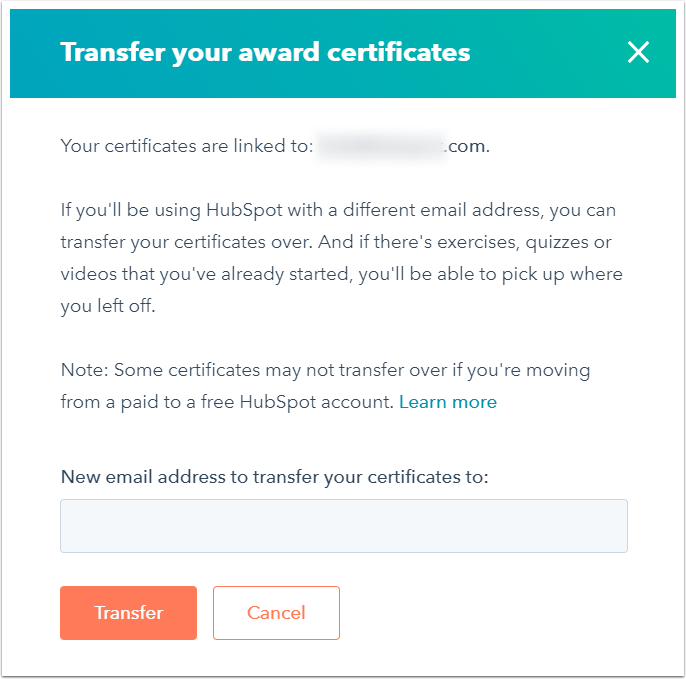 If a HubSpot user changes their email address, any certifications associated with the user's original email address can be transferred to the new email address. Click the My team tab. Here, you'll see the certification statuses of each HubSpot user in the account. Locate the user's existing email address. Click the Manage certificates dropdown menu under the email address, then select Transfer certificates to a new email address. In the dialog box, enter the New email address to transfer your certificates to, then click Transfer. 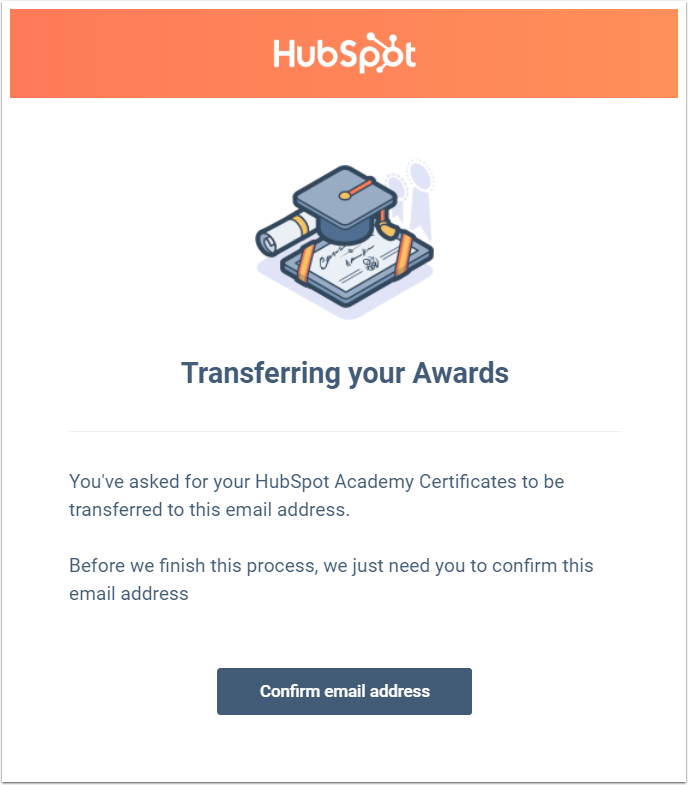 To transfer certifications to a new email address, that email address must associated with a user in a HubSpot account. Learn more about creating users in your HubSpot account. All certification statuses (even in progress) will transferred to the new email address. Review and confirm the certificates that will be transferred to the new email address, then click Yes, transfer. You'll be redirected back to the My team tab with an in-app message: "We've sent an email with a link to [new email address]. Click on the link in the email to confirm your address and finish the transfer." Navigate to your new email address inbox and open the email with the subject Transferring your awards. If the email does not appear in your inbox, check any Promotions or SPAM/Junk folders. In the email body, click Confirm email address. 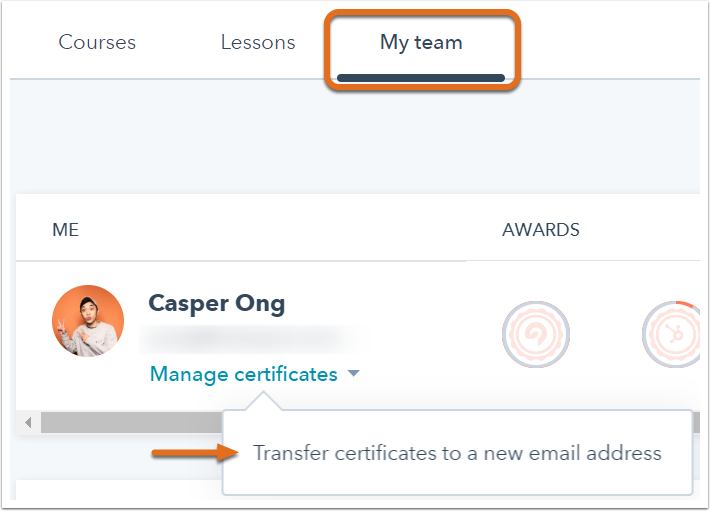 You'll be redirected to the My team tab in the learning center, where the certificates will now be associated with the user with the new email address.